Well, here it is! 1 pure watt of tube/overdriven power! 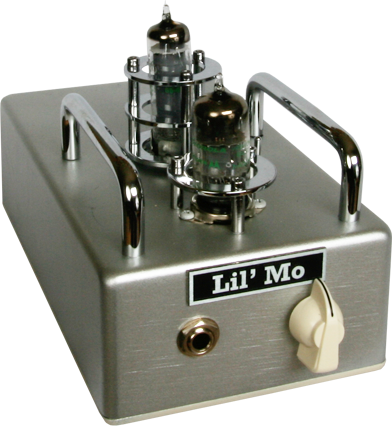 This newly designed and upgraded Lil Mo’ comes with a change in layout as well as an additional switch for added gain. Left is “normal”. Right is added gain. Tube complement is: one 12AX7 and one 6AQ5 (triode-strapped). The delight is that you can do all the tube swapping you like. Both tubes are abundant in quantity and tonal flavors. Too much gain for you? Try a 12AT7, 12AY7 or 5751. The output is fixed at 8 ohms. But since there such little power, a 4 or 16 ohm cab is no problem. Allen Bradley carbon composition resistors, Orange Drop, Mallory 150 and polypropylene bypass caps. The power transformer is loafing. ALL DC filtered filaments = LOW NOISE. Nice heavy-duty Hammond cast-aluminum chassis. Boutique amp build-quality. CLASS A. No feedback circuit. Everyone loves Class A amps for their dynamics! Simple amp. One input, One control (volume), one output and one blue/violet LED. Play in your bedroom and still get stack dynamics/sustain!